What Are the SEO Benefits of Reputation Management? It may be plain to see how online reputation management efforts can affect the ways consumers perceive your company or brand. But ORM can do wonders for your SEO strategy, too, helping you achieve greater visibility in search engine results, drive more traffic, and improve your conversions. Let’s talk about some popular SEO reputation management concepts that can supercharge your performance. So you’ve been collecting a lot of 5-star reviews, both solicited and unprompted. And the social media influencers you’ve worked hard to build relationships with have finally become true brand advocates. Plus: your community outreach and engagement efforts have vastly improved consumer perception of your brand. With such a positive reputation, you can expect to see branded searches grow. And that’s a powerful thing. After all, if consumers are searching online for your product or brand by name, they’re more likely to convert, and they’d also be deeper within the sales funnel. In fact, according to Google, branded search terms have over 2 times higher conversion rates than non-branded keywords. Responding to reviews, both positive and negative, can boost your company’s reputation. It shows the reviewer that their customer experience is of utmost importance, and it demonstrates to readers (your potential customers) that you care about and are always listening closely to feedback. Review response has SEO benefits, too. A Google My Business Help page suggests that both reviews and review responses may factor into your business’ search visibility, and even increase the likelihood that a potential customer will visit your location. This isn’t to mention the fact that responses to publicly displayed reviews also make up fresh content that is going to be crawled by search engines. 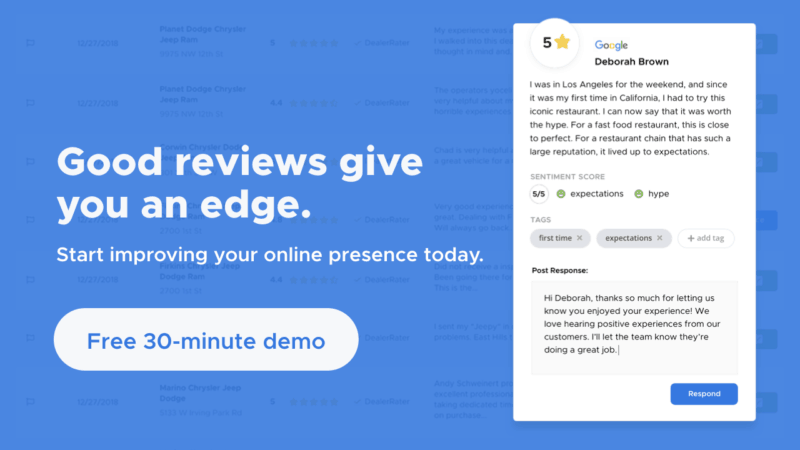 It is not uncommon for smart reputation managers to incorporate into their review responses any keywords they want to use for SEO purposes. As you can see, the top-rated businesses relevant to the aforementioned search term are featured in the local “Google Maps pack” or “3-pack.” This pack appears before the rest of the organic search results. Users see this first. And they’re more likely to click on any of the three featured businesses than on the other businesses that follow. Now, there’s a wide range of factors that determine how Google determines which businesses appear in this pack. Among the factors? Your online reviews and rating scores. If you apply best practices in online review management as part of your reputation strategy, you’re giving yourself a chance to be part of the Google Maps pack. Reputation managers that are able to maintain strong ratings and garner many positive reviews across the Web give themselves a better chance to win this prime search engine real estate. An increasing number of consumers are using search engines to find, discover, learn more about, and get directions to local businesses. If your reputation management strategy includes efforts to strengthen those local signals, and to get listed in as many local directories as possible, or to build high-quality citations across the Web, then you’re in a great position to improve your ranking in local search results.